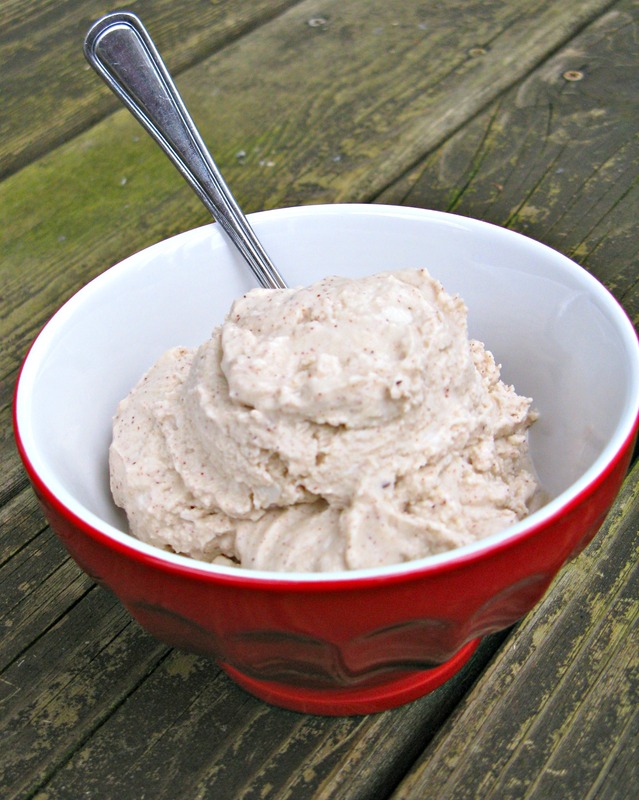 Behold: vanilla hazelnut butter ice cream. It’s dairy-free, nutty, creamy and so dreamy! The idea for this treat all started with Jesse. You see, I haven’t made ice cream in a while and apparently Jesse noticed, or had a craving at the very least. I say this, because he came home the other day with two boxes of coconut cream, which is what I use to make ice cream sometimes (combined with coconut milk). He said, “Look, I bought you something!” What he meant was, “I bought you this, so you can make me ice cream!” Needless to say, I got the hint! 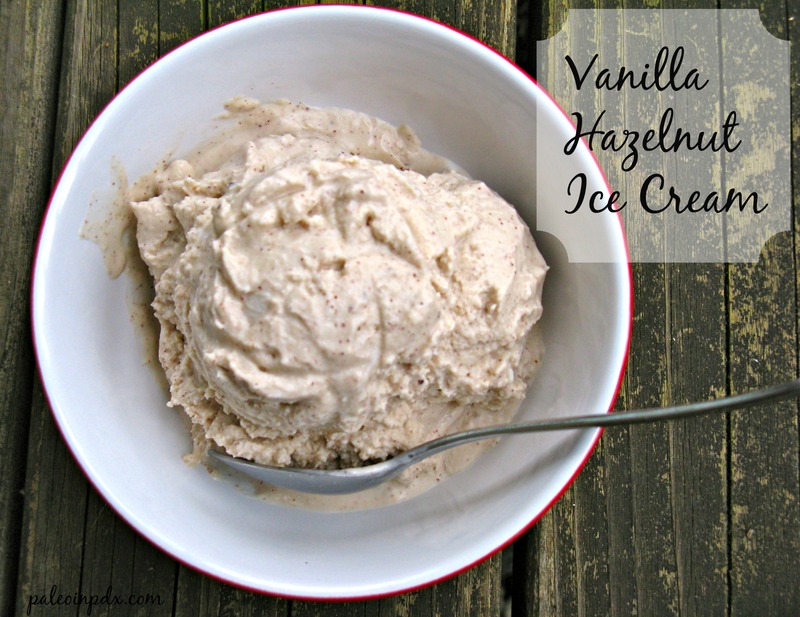 I love my plain vanilla ice cream recipe (everything below, minus the hazelnut butter), which is what I was going to make, but then I got the idea to add fresh hazelnut butter. I was shopping at the Alberta Co-op on Friday, and spotted it in their bulk section. They have a big bucket of it and you can scoop out as much as you want. I appreciate this because hazelnut butter is spendy and even though it’s still expensive in bulk, I can buy just a little bit, making it pretty affordable. This way too, I won’t go hog wild and eat it all. If you can’t find the coconut cream, don’t fret! Just replace it with more full-fat coconut milk. It’ll work just fine. I make ice cream this way as well. It really just depends if I have coconut cream on hand or not. The coconut cream makes the ice cream a bit thicker and richer, but it’s still fantastic and creamy with more coconut milk in its place. Additionally, you can use a different nut butter if you can’t find hazelnut butter in the store and don’t have the availability to make your own. This recipe would obviously be awesome with unsweetened cocoa powder added to the mixture too. I actually contemplated doing so, but we decided we wanted the vanilla base, so the hazelnut flavor could really shine through. Maybe next time. Add the coconut milk, coconut cream, vanilla, honey and sea salt to the blender. Don’t use a food processor for this — you’ll end up with a mess if you do. Blend on high for a couple minutes, until the mixture is smooth. If your coconut cream is cold because you already had some open and stored it in the fridge, it may require more blending. Just keep blending until it’s smooth! With your ice cream maker turned on, pour the mixture into the freezer container. Let churn for about 18 minutes. Then, add the hazelnut butter and continue to churn for another 3-5 minutes or until hazelnut butter is mixed through and ice cream is thick. Scoop ice cream into a container that can be stored in the freezer. Serve some up right away or place in the freezer to firm up a bit more, if desired. I didn’t do so, but feel free to garnish with some chopped raw hazelnuts. Oh this looks SENSATIONAL! Man…there simply isn’t enough hours in the week to make all of these beautiful recipes! Thanks, Amy! I appreciate your enthusiasm over it 😉 Thanks for the follow too! Tried this recipe last night along with your brownie recipe (I thought the two would go good together! I was so right!) I love hazelnut ice cream particularly when it is pared with chocolate. In fact, I adapted your recipe using homemade chocolate hazelnut butter to get that Burgerville milkshake taste. I liked it even better! So I no longer have to feel like I missing out, I can make my own! Thanks again! Good to know that they work together! I like your variation of the recipe too. I’m thinking of adding cocoa powder to the ice cream next time. It sounds SO good! You’re right, no need to miss out. Plus, you get something even better and know exactly what’s in it! I am so making this tomorrow but going to substitute with macadamia nut butter that I bought the other day on sale. I wonder how rawtella would work in it? Oh yum! I bet it’ll be awesome with macadamia nut butter! I’m not familiar with rawtella, but if it has a similar consistency to other nut butters, I’m sure it’ll work just fine. Enjoy! Made it today and turned butter like mixture.Where did I go wrong.Followed recipe above. It’s hard to say. You followed it exactly? If you used different coconut milk and coconut cream brands than the ones I refer to, it could cause slight differences. Also, maybe you needed a little longer churn time than what I did. The ice cream is a softer style, but then firms up more in the freezer. Sometimes, just a couple hours in the freezer after it’s done churning helps. I tried it and it was delish!!! Thank you.